Skilled and experienced Tradesmen and Contractors are Onsite to Handle the Vessels Repair Needs! Vessel Preferred Sub-Contractors are Welcome! While Your Yacht is Being Serviced, Repaired and Refit! 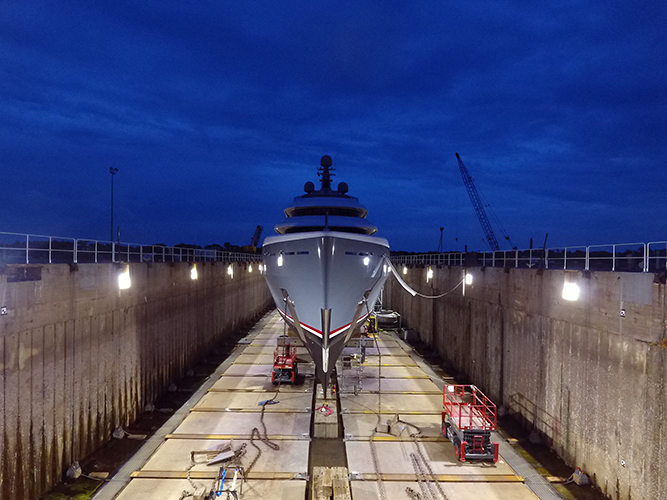 Savannah Yacht Center is a premier deep-water superyacht maintenance, repair and refit facility dedicated to servicing the yacht industry. We are unique on the East Coast of the United States in our ability to service some of the largest superyachts in the world. Savannah is consistently named one of the "world's friendliest cities" by Condé Nast Traveler readers, our coastal town has a world-class reputation for hospitality and grace. Discover Savannah as we repair, refit, and ensure the maintenance of your yacht. Or come play on America's favorite island, Hilton Head Island with more than 24 world-class golf courses and 12 miles of pristine beaches. Charter fish, kayak or paddle board through the salt marshes or enjoy the beaches on Tybee Island. Have fun visiting Savannah and the surrounding Low Country as your yacht is being serviced, repaired and refit. © 2016 - 2019 Savannah Yacht Center Inc.